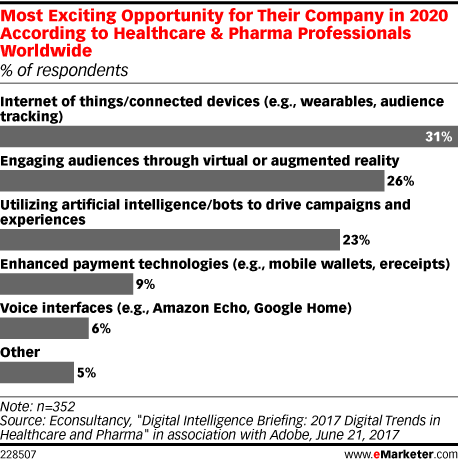 Data is from the June 2017 Econsultancy report titled "Digital Intelligence Briefing: 2017 Digital Trends in Healthcare and Pharma" in association with Adobe. 497 healthcare & pharma professionals worldwide were surveyed during November-December 2016. Respondents were from Africa (1%), Asia-Pacific (10%), Australia/New Zealand (8%), Europe (22%), the Middle East (1%), North America (57%) and other (1%). Respondents identified their roles as board-level (2%), C-level/general manager (2%), director/senior director (16%), junior executive/associate (18%), manager (35%), VP/SVP/EVP (2%) and other (25%).